It goes without saying that stadium lighting at a sporting venue in Croydon, Sutton, Bromley or elsewhere in London needs to be sufficient to allow the sport to take place both safely and effectively. It needs to provide good viewing conditions for the spectators too. Outdoor sporting facilities which are to be used during twilight hours and after dark must comply with the lighting regulations of the governing body of the sport concerned. These include minimum levels of stadium lighting for training and different categories of game e.g. internationals, premier or national games and even local club games. In some cases your club will not be allowed enter certain competitions without approved floodlighting of the playing area (or outdoor swimming pool). Conventional HID (high intensity discharge) lighting will use up a significant amount of your club’s budget during the winter months. These convert electricity into light by forming an electrical arc (big, controlled spark) that passes through a mixture of gases. As well as the high running costs, they often contain the toxic heavy metal mercury. One suitable alternative to conventional floodlighting that we hold in high regard is the OptiVision LED gen2 by Philips Lighting®. This is a high performance IP66 rated LED floodlight that produces an outstanding quality of light for any sporting application. The driver is external to the floodlight and can be either fixed remotely or attached to the floodlight bracket. If you have an existing control system using the DALI protocol, these LED floodlights are compatible. Apart from the energy savings, LED stadium floodlighting has an instant start up and much longer expected life than conventional stadium lighting. If you want to reduce your electricity bill and improve your club or council’s environmental credentials, call South London Electricians on 0208 406 9834 to discuss changing to LED floodlighting. Car Parks at night are often perceived as being slightly risky places to be. Good lighting in a car park can help to discourage crime and help people feel more comfortable. We realise that a car park is not always fully used and so you will be wanting to balance cost and convenience to users as much as possible. That is where LED floodlighting steps in. With no lighting warm-up time, the lights can be switched on later than conventional car park lighting and can be left on longer – a LOT longer – for the same costs. Here at South London Electricians, we also recommend the Philips Lighting® OptiVision LED gen2 floodlight for car park applications. The lighting level is programmable so that it can be brighter at peak times such as Xmas shopping late opening nights and dimmed at off-peak hours when fewer people are using the parking facility. It is constructed from aluminium and polycarbonate and has an IK08 (5 J vandal protected) mechanical impact rating. 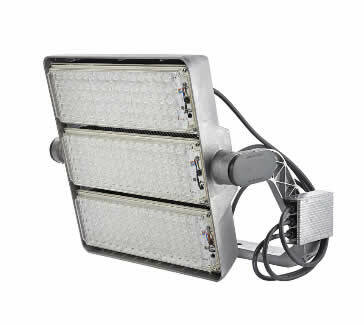 There is a 5 year warranty on the lighting unit and an L70 expected lifetime of 50,000 hours. Thus, as well as the electricity bill being lowered, maintenance costs are also significantly lower too. So why wait any longer, call us on 0208 406 9834 to find out how we can help you. 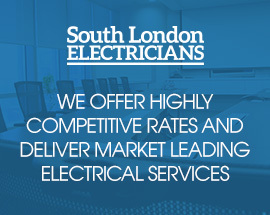 Why Call South London Electricians for your Sports Venue Lighting Solution? Firstly, you speak to an electrician directly, thus you will not be waiting for a call back after speaking to a secretary or someone in a call centre. We cover all areas of South London – Richmond to Bromley, Bexley to Kingston-upon-Thames through Merton, Southwark, Greenwich, Wandsworth, Lambeth Croydon and Lewisham, as well as Westminster and Chelsea (OK, we know they are north London but we do venture over the Thames from time to time!). And our fleet of electric powered vans have the range also to visit places beyond the boundaries of Greater London – like Banstead, Caterham, Carshalton and Sutton.